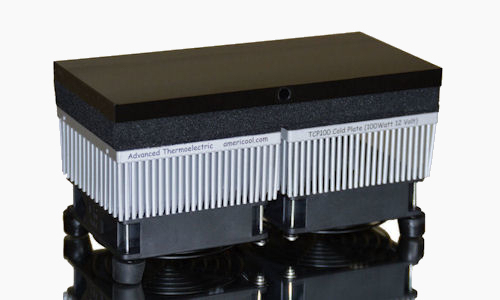 The ElectraCOOL™ TCP100™ Cold-Plate has a simple, elegant design with outstanding cooling capacity for its size. It's easy to use, reliable and environmentally friendly. High performance components and a well engineered package provide 100 watts of cooling capacity in a compact 4 x 8 inch footprint. Rubber feet minimize fan vibration. 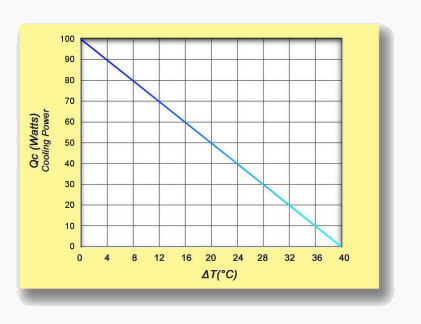 TCP100 may be used for either cooling or warming. In an ambient temperature of 68 ºF (20 ºC) the surface can reach the freezing point in less than 10 minutes and has a low temperature of 21 ºF (-6 ºC). Alternatively, the surface can safely be used for warming up to 175 ºF (75 ºC). 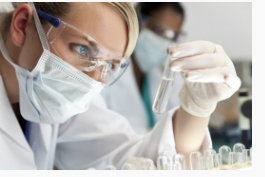 TCP100 is used in a wide variety of laboratory, calibration, test - quality control, electro-optic/laser, research and packaging applications. 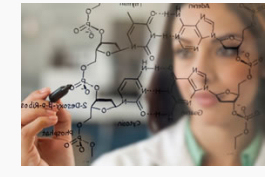 Typical medical/biomedical applications include sample cooling or temperature stabilization, tissue preparation, histology, cold & hot dry wells, pain/nerve research and field/lab work with insects, particularly for investigating mosquitoes for West Nile virus. TCP100 has two sets of thermoelectric devices sharing a common cold-plate. Depending on your requirements, TCP100 can be wired for 12 volt operation, by connecting matching leads in parallel, or for 24 volt operation by connecting the appropriate leads in series. 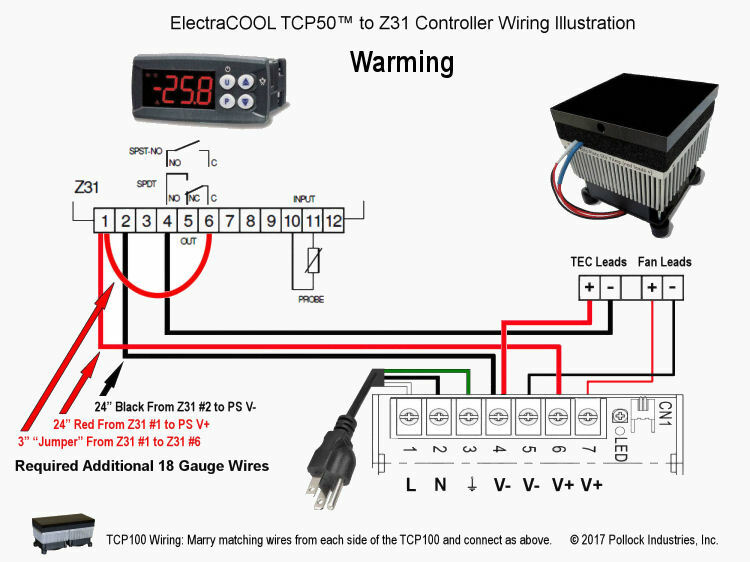 For applications that require temperature control, the TCP-100 can be connected to a temperature controller, like the basic 12V Z31-A or the 24V TLK38-S with PID control, an auto-tuning function and a second available set-point. While typically used on a laboratory or work table, the TCP100 may be mounted in any orientation. Many customers have used multiple units to "sandwich" (or surround) an item requiring cooling from two or more sides such as a liquid heatsink. It’s also common to use multiple units to increase surface area. The cold-plate can be customized or fabricated for customer specific applications such as mounting sensors or optics packages. The plate is 6063 aluminum with a black anodized finish. Contact us for a machining quotation if you need ten or more customized TCP-100s. If you need a smaller cold-plate, see our 4 x 4" TCP50. 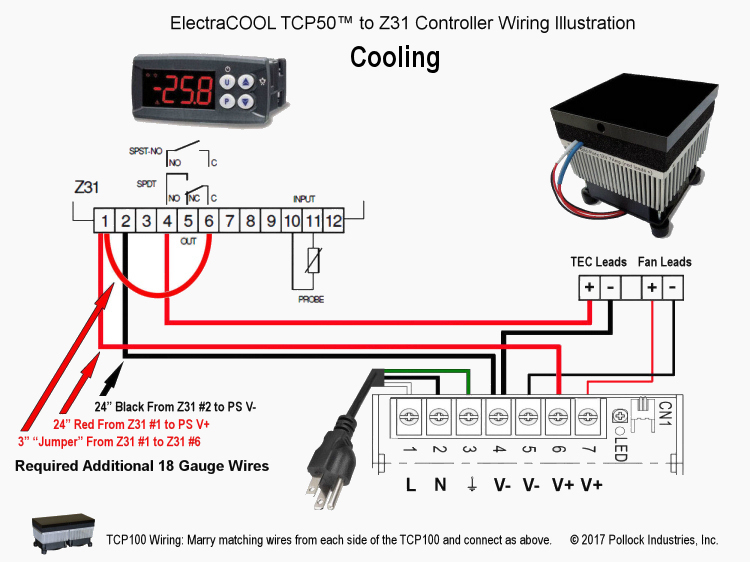 Cooling Fans = Brushless, Nominal 12 or 24V D.C. Tested and calibrated to your set-point (other than +4 °C). This service is free - please allow 2-3 business days. 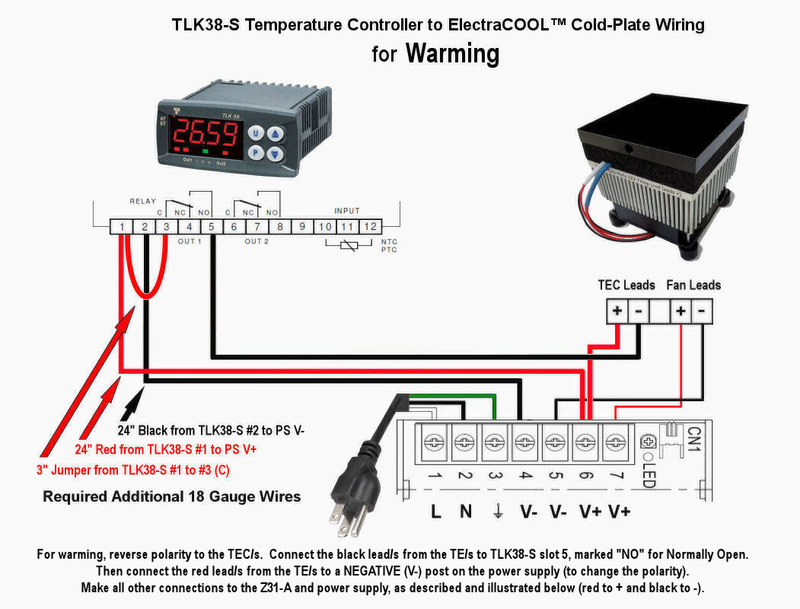 When you purchase an ElectraCOOL™ Cold-Plate Set, we've taken care of setting things up. Available in easy to operate 12V or precise 24V configurations, simply plug-in and your cold-plate is ready work. The default surface temperature is 4 °C (39 °F) however, we are happy to program and calibrate to a different set-point. Please advise and allow 2-3 days for modifications and test.